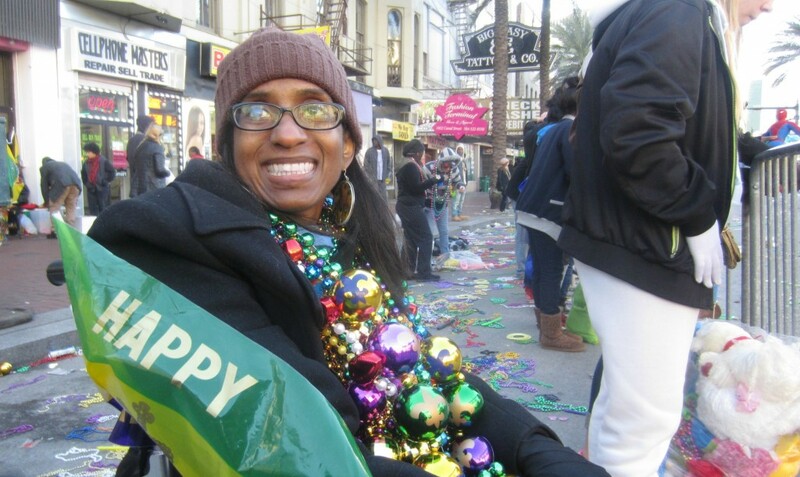 I have attended Mardi Gras festivities in New Orleans, Louisiana since I was a child. 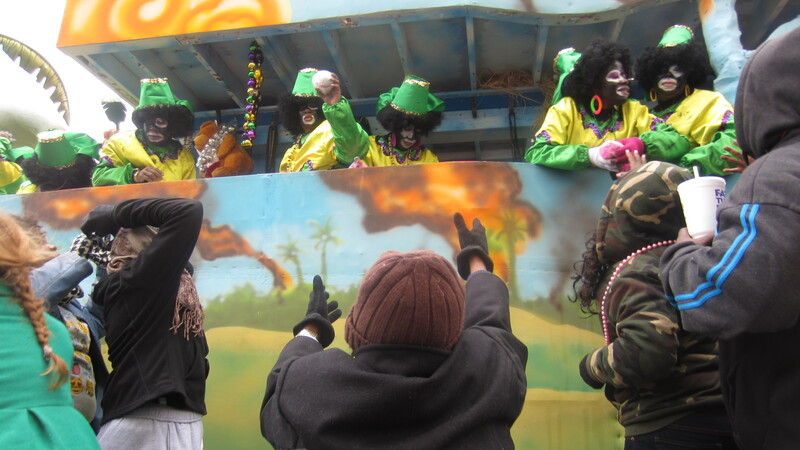 It’s crazy because the parades and parties start a month before the actual big day (Fat Tuesday). And every year, I am there either partying with friends or going to parades with family. But this year, I felt different. I didn’t want to do anything. I blamed my outlook on fatigue and being wheelchair bound but really that wasn’t it. I think I was a little down and feeling sorry for myself. Then I got the following message from my Internet friend, from Canada, Christine. After reading that, how could I say no? I know Christine because she reads my blogs and I was excited to actually meet her in person. So I quickly shook off the blues and began planning some places to go and some parades to attend. I’ll be damned if I let a Mardi Gras rookie out do this veteran. So I set up an itinerary for myself. She got to New Orleans on a Friday night. 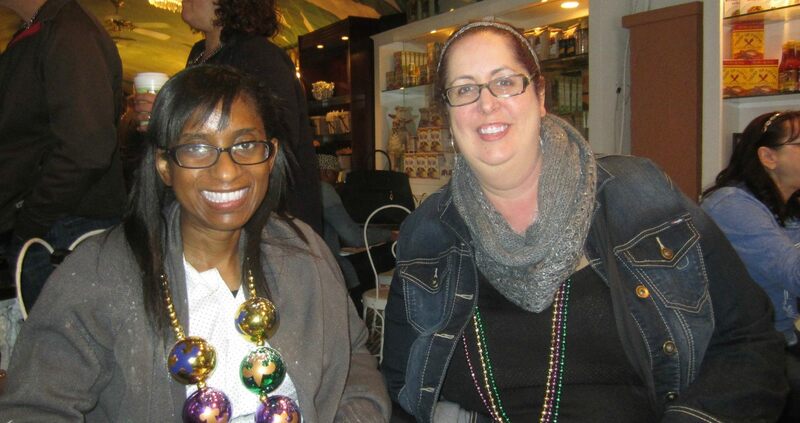 The next day, in between parades, I met Christine, her husband Kip, and two friends Tahir and Shadya, for beignets in the French Quarter. We sat, talked and ate. Which are all my favorite things. It was so great. I was really weak but still able to ask a couple a questions I had about how she was dealing with MS.
After about an hour, we said our goodbyes, Christine got on her scooter and off they went to another parade. I had a wonderful time and was really inspired by Christine. She doesn’t let MS stop her from living a productive life. Even the times when she isn’t able to achieve what she originally set out to do, at least she tried. And that’s something MS can never take away, your ability to try. Hi Nicole! So glad to here that you had a chance to meet a new friend! I so relate to this Nicole. I have found myself immersed in feeling sad and unhappy about myself and then I have a chance to brighten someone else’s day which ends up having the same affect on me and being a lot of fun! Sometimes it feels as if MS really has the upper hand and I don’t have the wherewithal to try to figure out a way to get past the obstacles. Thank you for sharing your life with us through your blog. Thanks once again for a dose of inspiration and encouragement! And you are looking fantastic as always! Glad you had fun and got to meet your friend in person. I’ve gotta praise you for finding the strength to enjoy New Orleans (a city with a six-drink minimum, it seemed to me when I was there… Guys with barrels on their backs dispensing Hurricanes, and such). But ah, the beignets! You have the most beautiful smile Nicole, you make me smile when I look at the photos, so it is a good thing that you got yourself up and went to meet Christine and her family. I have never been to New Orleans, however it looks like so much fun. I bet you would never have thought that you would be a travel guide, keep trying, you never know what is next. Best wishes. Mission accomplished Nicole….you helped someone, you were an encourager. You chose the nursing profession and I chose to study speech pathology. We both engaged as professionals in those two professions as long as our bodies allowed us to. For reasons not known to either of us we were removed from our chosen professions way too early. 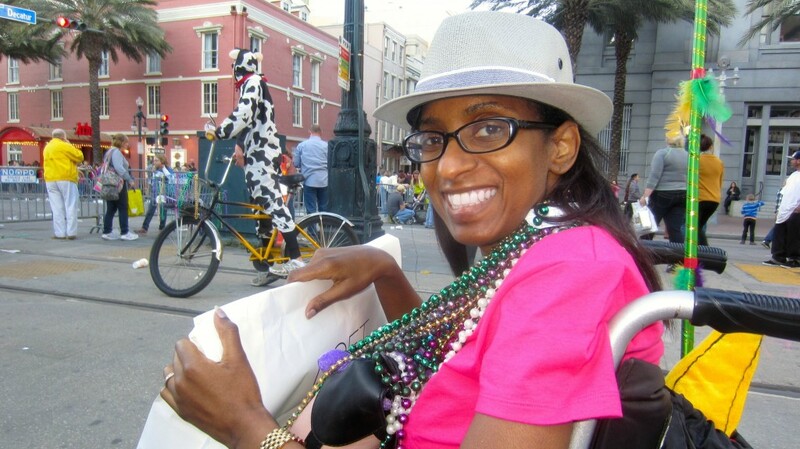 Reading this blog about you helping Christine was an eye opener for me. We have been placed in new situations with MS but the bottom line remains….we are still convicted to help others out. Mary, yes we have. I never thought about it that way. Thanks. Nicole, I look forward to reading your posts. You are honest and I love that.